Spencer Duffy, the box-owner of CrossFit Maidstone, is giving us a little insight into what happens at his BOX! Enjoy another episode of our Europewide BOX interviews. Address / Location: Unit 8, The Broadway, Maidstone, Kent ME16 8PS U.K. Through trial and error. I’ve been a bit of a journeyman having tried most things from bodybuilding to triathlons. The one thing that has stayed constant throughout the journey is my love of fitness. The question was asked ” if money wasn’t an issue what would you do?”. The answer was run my own gym. Then my life became clear and I started to align the stars to make it happen. We are obsessed about the development of our athletes. There are no show offs at the gym. It’s all about having a good time and training hard. Our community is strong and our members all get along. One of the rules is no shirts off….ever! If you feel we need to see your pecs you’ve come to the wrong box. We are experienced gym rats, so we understand how to get results. There are already 50 full time members. The majority are male but the female numbers are growing steadily and I would like to see a 50/50 split in the future. We have members aged from 16 to 58 and all train together. Maybe in the future we will have athletes who compete but for now it’s all about building a family who understand CrossFit and can demonstrate flawless technique. We are a Krav Maga Global affiliated club, so we teach self defence twice a week. We are also members of the British Weight Lifting Association. We have a local school that attends once a week and we help them do weight lifting. There are one or two lifters that hopefully one day will be in the Olympics. We have also sponsored a future Olympic Gymnast who assists us with gymnastics skills. Yes always, it’s part of our on ramp process. We also sell various supplements in the gym. We are keen to promote all aspects of fitness. We take it slow for beginners. Everything is scaled according to the individual’s ability. We do a lot of technique based exercises and mobility work. It’s important that our athletes learn how to do CrossFit and not just wait for instruction, even if they stay for just a short while they will hopefully leave better then when they started. Do you organise any internal or open competitions? Not yet, the box is still too new and I’m a perfectionists, so maybe next year. I actually completed my on ramp at another box but we’ve been so busy opening up and training that we haven’t had time. Fingers crossed when things settle down we can hook up with some other boxes. Absolutely we welcome people from other boxes. We are a diverse gym with athletes from all over Europe so language is not an issue. Fran is Fran where ever your from. 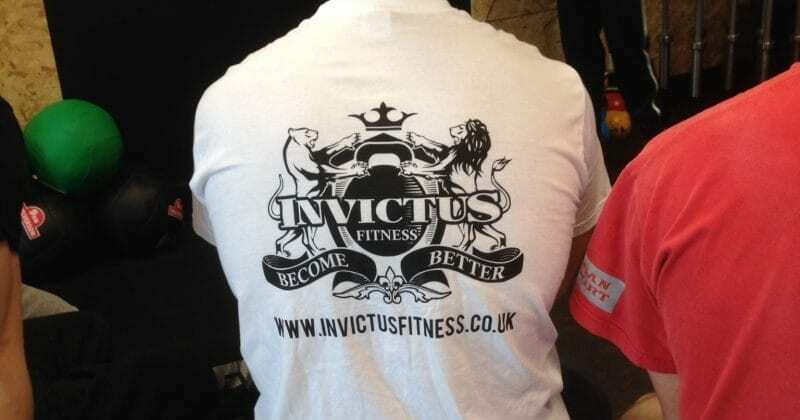 Contact me (Spencer or Connor) at team@invictusfitness.co.uk . Our motto is ‘Become Better’ but we also like ‘We suffer until we are unbreakable”. Being tough can never be underestimated.